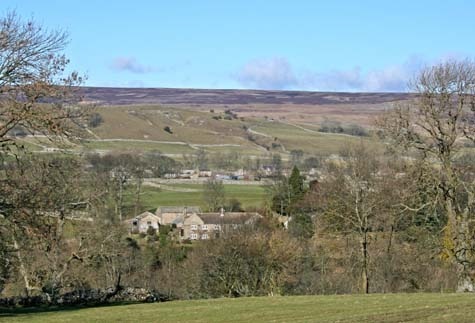 It takes just 10 to 15 minutes to walk across the fields from the eastern end of Aysgarth to Aysgarth church and Aysgarth Falls. This walk begins at the bottom of the lane below the Methodist chapel. 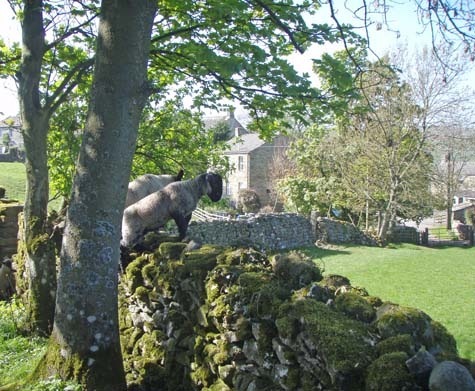 Last spring those two lambs had jumped over onto the footpath which at that point runs between a hedge and that drystone wall. Above – trying to get back to mum. At the next stile on the way to the church it is possible to see both Bear Park and Carperby to the north (below). Bear Park was originally owned by Marrick Priory in Swaledale and the present house was built in the 17th century. As you approach the church you can see a large building to the right which was once known as the Palmer Flatt hotel because it was built on the site of a medieval hospice for pilgrims or “palmers”. This is being completely refurbished by the new owners and should be open by early summer if not before and will be known as the Aysgarth Falls Hotel. The car park at The Falls is also visible, as well as (to the right) the large building which now houses a book store. This was the original home of Aysgarth preparatory school and in 1881 there were 81 scholars. By 1891, however, the school had moved to its present site at Newton le Willows. In the 1920s and 1930s the building was part of a TB sanatorium and later served the area as a YHA hostel. 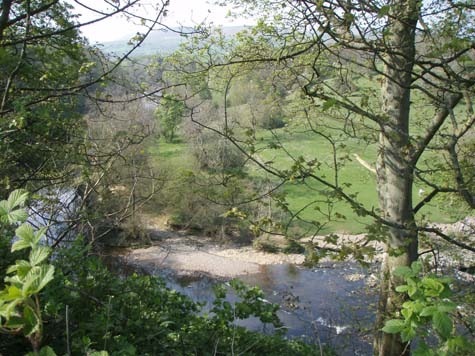 As you enter the field directly below the hotel it is possible, from the fence on the left, to look down on the River Ure (below). Or you can go up the path towards the hotel to get a better view of Bolton Castle across the river to the north east. The footpath across that field takes you to Church Bank road and on the other side is what may be the largest churchyard in the country. You can take time to visit Aysgarth Church (St Andrew’s) which is open every day or turn left just inside the main gates onto a path which takes you to the northern exit from the churchyard. Descend the steps to reach Yore Mill. This began life in the late 18th century as a cotton mill and over the next two centuries was used to produce worsted, to grind corn and then flour (see Yore Mill). There was a school in a room in the mill complex in the early 19th century run by John Drummond, a noted mathematician. In the census for 1891 there were nine households listed at the mill complex, ranging from a clerk in holy orders living in one of the small cottages to the corn miller with his wife and six children. Today the mill is used to generate some electricity for the National Grid and the once derelict cottages behind the gift shop are being renovated. The bridge was built in the 16th century for pack horses and was only nine feet wide. It was rebuilt in the 18th century when the turnpike roads were made. Do be careful crossing the bridge as there is no footpath and is just wide enough for two cars! At the other side turn left through the gate to the Upper Falls. 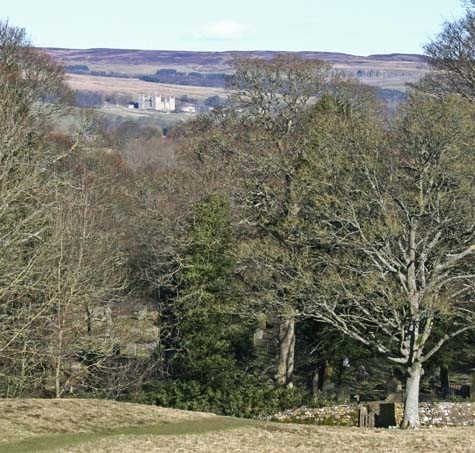 In this parkland meetings and galas were held which, in the mid 20th century, included the Aysgarth annual show with sports, fancy dress and tea tents. Across the river are the remains of lead mining and a bit higher up the river is Aysgarth Mill where electricity was generated for the village in the mid 20th century. Back at the road take the footpath on the left through the woods to the National Park car park where there are toilets and the information centre in which there is an exhibition about how the falls came into being and the wildlife of the area. Outside the information centre there is a mosaic made by local children. For more photos (all copyright Pip Land) see Aysgarth Falls.